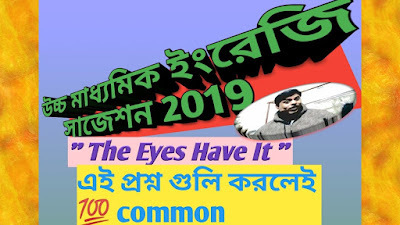 Hi students today we will discuss about some important questions and answers from the story '' The Eyes Have It '' which may be the most important suggestion for the final examination 2019 for the HS students . I think to you will be able to get common from these questions . So Best of luck.and cheers up. Ans :see the answer of model 6-Ray and Martin solved. Prose section 1. 2)'' oh, how lucky you are! '' - - who is the speaker here? Who is 'you' referred to here? Ans : The girl whom the narrator of Ruskin Bond's story '' The eyes have it'' met on the train is the speaker. Here' you' is referred to the speaker of the story the eyes have it. The narrator met a blind girl at Rohan Station. Probably her parents came to see her off. The narrator asked the girl if she was going all the way to Dehra. The girl at first startled and ensured that she would get off at Saharanpur where her aunt would receive her. The girl then asked the narrator about his destination. In his reply the narrator said that he would go up to Mussoorie. Then the girl told the narrator as lucky. The narrator was considered lucky because he was going to Mussoorie in October when the hills are very beautiful. The girl Loved The Hills and wished she could visit the Hills of Mussoorie in October. Ans : 'she' here refers to the girl whom the narrator met on the train. The girl had to get down at Saharanpur. So when the train approached the station she got up and collected her things. After that she came closer to the narrator to bid him goodbye. As she stood very close to the narrator The Perfume of her hair was tantalizing to the narrator and he wanted to touch her hair by raising his hand but before he could do so she moved away. Even after her departure the scent of her perfume lingered on in the air. Ans : The narrator of the Ruskin Bond's short story 'the eyes have it' is the speaker here. Here 'her' refers to the girl who boarded the train compartment at station. When the narrator asked the girl if she was going to the Dehra, the girl was startled. Actually, she, like the speaker, was also blind. She was unaware of another's presence in the compartment. So she was startled by the voice of the speaker. The girl gave a little exclamation and said that she was unaware of anyone's presence. Being a blind girl she could not realise the presence of any body until she heard the voice. But her exclamation was not great as she , it seems, often faced such situations. Ans : in Ruskin Bond's short story the eyes have it, a couple was anxious. The comfort of a girl, who was probably the daughter of the couple, is referred to here. The couple came to Rohana to see the girl off. They seemed to be the girl's parents. The narrator felt it from the couple's parent- like attention to the girls comfort. The couple, especially the woman, gave details instruction for the girls safe journey. She told the girl do's and don'ts of a train journey. She Instructed the girl where to keep her things, when not to lean out of Windows and how to avoid speaking to strangers. 6)'' the voice had The Sparkle of a mountain stream'' - - who thinks so? Whose voice is referred to here? Why did the voice become so special? Ans : see the answer of prose section. Ray and Martin solved Model 4.